Stroudsburg First Presbyterian Church was organized in August 1827, largely due to the efforts of Rev. Jacob T. Field. Field had been commissioned by the American Home Missionary Society to work in the vicinity of Mauch Chunk, but upon arriving discovered that the position was already occupied. He came to Stroudsburg to visit relatives and was invited to the home of Daniel Stroud, where he met, among others, Rev. Solomon Carpenter, a well-known evangelist of the time, and the Hollinshead sisters, two Presbyterians wishing to organize a church of their faith. Field decided to stay in the area. Assisted by Carpenter, he organized meetings that resulted in a great spiritual awakening throughout the community, which led to the beginning of the First Presbyterian Church. The congregation of 11 people (8 women and 3 men) met in a barn that stood on the present site of St John's Lutheran Church. From 1831-1834 they worshipped in a school building/public hall at the corner of Main and N 8th Street. In January 1834 the congregation moved into a new building on a lot donated by Daniel Stroud at 806-808 Sarah Street. The Civil War brought a great increase in church attendance, so much so that it was determined that a new church should be built. The present structure at 575 Main Street was built on a lot purchased in 1867 for $2,200. The new church building was completed in September 1868 and was dedicated on October 8, 1868. 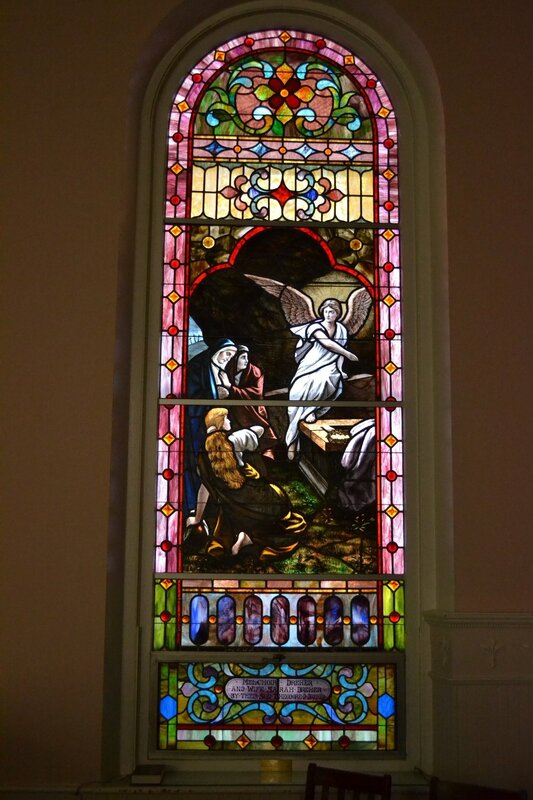 Of note are the stained glass windows in the sanctuary. The front doors are flanked by two original windows, which are old English stenciled glass with a fleur-de-lis design. Until the beginning of the twentieth century, all the sanctuary windows resembled these two windows. Starting in 1901, the 10 side windows were replaced with stained glass windows. Two of the windows are in the balcony. One depicts a cross; the other, a Bible and lily. They were donated by the church Board of Trustees. The other 8 windows are elaborate stained glass picture windows, representative of the quality and craftsmanship of stained glass art of the early 1900s. They depict The Empty Tomb, donated by the Dreher family; St. Paul, donated by the Sunday School; The Giving of Alms, donated by the McIlhaney family; John the Baptist, donated by the Christian Endeavor Class; Christ Praying in the Garden, donated by the Kern family; Christ Knocking at the Door, donated by the Brown family; Let the Children Come, donated by the Wyckoff family; and The Woman in White, donated by the Holmes family. In the Presbyterian tradition there are pastors, also known as teaching elders; the Session, the ruling body of a congregation and also known as ruling elders; the Board of Deacons, providing compassionate care to the church community; and the Board of Trustees, in charge of fiscal affairs and maintaining the physical structure. In its 188-year history, First Presbyterian has had 28 pastors. Of particular note was Rev. Dr. Ernest Campbell (1949-1953), a remarkable preacher and evangelist. Campbell went on to serve Riverside Church in Manhattan (1968-1976), begun by John D. Rockefeller, Jr., and Harry Emerson Fosdick. Campbell was the first Presbyterian to serve that church. The more recent clergy include Rev. Dr. Chris Petrak (1979-1997), Rev. Dr. Carol Brown (1983-2012), and Rev. George Taylor (1998-2014), all of whom retired from Stroudsburg First Presbyterian Church. Women have always played an important role in First Presbyterian from its inception. Unfortunately, church records record little of their involvement in the first 50 years. However, of note is the Women's Missionary Society, formed in 1878. It dealt primarily with mission work, social justice issues, and spiritual development. This work is continued today by Presbyterian Women. Then in 1913 Mittie Case Easton became the first female Sunday School superintendent. In 1930 Caroline Holmes became the first female elder. In 1951 women began serving as deacons. In 1983 Rev. Dr. Carol Brown became the first female pastor. First Presbyterian has always been a church dedicated to mission work, both here and abroad, as well as opportunities for spiritual development and evangelism. At present FPC supports Pocono Area Transitional Housing (PATH), the founding of which was spearheaded by First Presbyterian member Margaret Wyckoff Wells; Women's Resources; the Salvation Army; FPC Community Emergency Assistance, a fund that aids local residents in need of short-term help; Family Promise, a national homeless-solutions program; Habitat for Humanity; and Kirkridge Retreat Center. First Presbyterian also is involved in a long-standing relationship with a self-help organization in northern India, as well as an ecumenical retreat center there. Over the years the church in Stroudsburg was instrumental in starting other congregations in the area, including the Fifth Street Mission chapel, built in 1909 in what was then the "poor fringes" of town to serve the less affluent community in that area. Today it is on the site of the Wesleyan Church. The Presbyterian churches in East Stroudsburg and Brodheadsville were also offshoots of the Stroudsburg church. Today Stroudsburg First Presbyterian is a welcoming, progressive congregation of slightly fewer than 200 members with a vibrant music program, a spirit-filled education program, and a strong commitment to our neighbors, wherever they may be. Presbyterians in Stroudsburg, by Rev. Dr. Chris Petrak, was used as a source.